"Meeting at Night" by Robert Browning is the Songs of Eretz Poem of the Day and the offering from Poets.org's Poem-A-Day for May 3, 2014. The poem is in the public domain and therefore legally reprinted here. The poem was originally presented in two sections, "Night" and "Morning," and was first published in 1845 in the poet's Dramatic Romances and Lyrics. 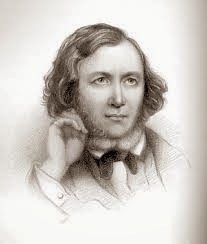 Robert Browning (1812 - 1889) (pictured) was known for most of his life as the husband of the more famous Elizabeth Barrett. "Meeting at Night" was composed during their courtship--they were married a year later in 1846. Eventually, Robert Browning achieved accolades of his own with the founding of The Browning Society in 1881. Reference to this and additional biographical information may be found here: http://www.poets.org/poetsorg/poet/robert-browning and here: https://mail.google.com/mail/u/0/#inbox/145c1a60387a0a30. What lady would not have swooned upon receiving "Meeting at Night" from her paramour? The iambic pentameter lends a lyric feel, and the complicated rhyme scheme creates a delicious anticipation evocative of awaiting the arrival of a lover.